> Tintri > VDI for Vmware View with Unparalleled Agility and VM Density. VMware Horizon View™ provides robust VDI capabilities and has exceptionally tight integration with vSphere. Likewise, Tintrí provides a storage platform that deploys quickly and delivers an unparalleled combination of performance and density for VDI in a compact data center footprint. 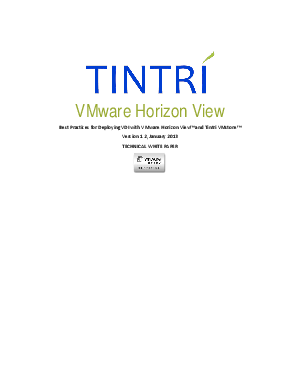 This helpful technical white paper offers guidance for deploying Hosted Virtual Desktop (HVD) VDI with VMware Horizon View™ on VMware vSphere and Tintrí VMstore.